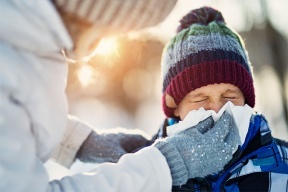 It is easier to spread the influenza virus (flu) than previously thought, according to a new University of Maryland-led study released Monday. People commonly believe that they can catch the flu by exposure to droplets from an infected person’s coughs or sneezes or by touching contaminated surfaces. But, new information about flu transmission reveals that we may pass the flu to others just by breathing. The study “Infectious virus in exhaled breath of symptomatic seasonal influenza cases from a college community,” published in the Proceedings of the National Academy of Sciences, provides new evidence for the potential importance of airborne transmission because of the large quantities of infectious virus researchers found in the exhaled breath from people suffering from flu. “We found that flu cases contaminated the air around them with infectious virus just by breathing, without coughing or sneezing,” explained Dr. Milton, M.D., MPH, professor of environmental health in the University of Maryland School of Public Health and lead researcher of this study. “People with flu generate infectious aerosols (tiny droplets that stay suspended in the air for a long time) even when they are not coughing, and especially during the first days of illness. So when someone is coming down with influenza, they should go home and not remain in the workplace and infect others.” Dr. Milton and his research team captured and characterized influenza virus in exhaled breath from 142 confirmed cases of people with influenza during natural breathing, prompted speech, spontaneous coughing, and sneezing, and assessed the infectivity of naturally occurring influenza aerosols. The participants provided 218 nasopharyngeal swabs and 218 30-minute samples of exhaled breath, spontaneous coughing, and sneezing on the first, second, and third days after the onset of symptoms. The analysis of the infectious virus recovered from these samples showed that a significant number of flu patients routinely shed infectious virus, not merely detectable RNA, into aerosol particles small enough to present a risk for airborne transmission.